Mumbai Indians will host Royal Challengers Bangalore at the Wankhede Stadium on April 15 in what would be the 31st game of IPL 2019. 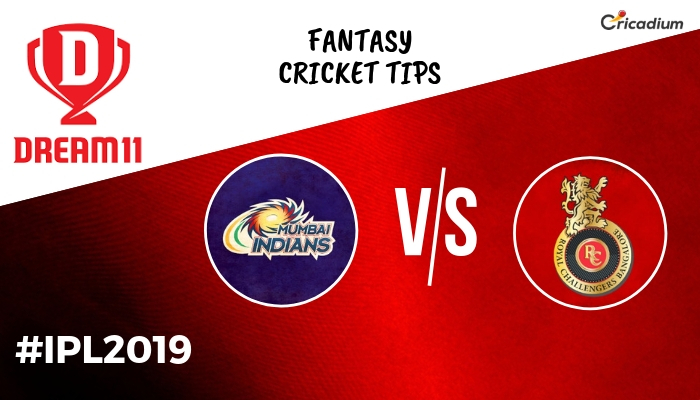 Keep reading to find out Dream 11 team prediction and Dream 11 fantasy cricket tips for the today IPL match 2019 MI vs RCB. While MI lost the last game against Rajasthan Royals, RCB won their first game of the season against Kings XI Punjab after losing 6 in a row. However, the visitors will face another tough challenge against a side that has defeated them already once in the league. Check out the Today IPL match 2019 MI vs RCB Dream 11 Prediction and Team. Between Parthiv Patel and Quinton de Kock, the latter is a better pick for the wicketkeeper’s slot for this game. De Kock scored 81 from 52 balls in the last game against RR and looked in top form. For the captain’s choice, AB de Villiers is a good option. He made 59 from 38 balls which was a Man of the Match winning performance against KXIP. Rohit Sharma too found form in the last game with a knock of 47. He might build up from there and that’s why he is also a candidate for the vice-captain’s slot. Hardik Pandya has provided the finishing touches for MI late in the innings and so, it’s a good thing to have him in the Dream 11 squad. Kieron Pollard, Moeen Ali, Jasprit Bumrah, Jason Behrendorff are the others who can be relied upon to do well.